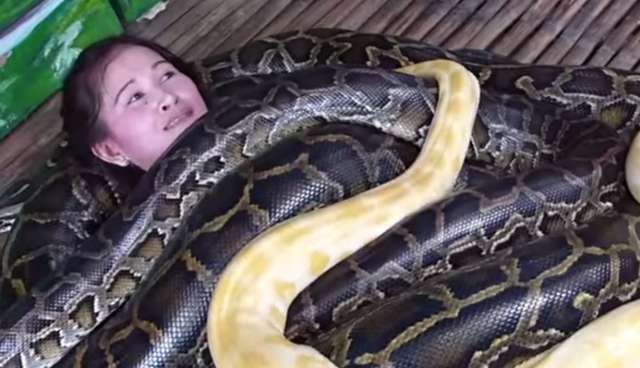 Apparently, the Cebu City Zoo in the Philippines offers tourists free "massages" any day of the week, but we wouldn't recommend getting one -- because the masseuses are five 20-foot-long Burmese pythons and it requires going to a zoo. The snakes, who weigh approximately 550 pounds combined, lay and slither atop those willing to partake in the treatment, but only after they're fed ten chickens each to stave off hunger. As the Daily Mail reports, the zoo's manager, Giovanni Romarate, said the zookeepers take great pains to make the snake massage safe. "Snakes do not attack as long as they are not harmed," Romarate said. "We also made sure that we use pythons because they are not venomous." On the surface, the massage seems like it has the potential to end much worse for the humans involved than for the snakes; at the moment, that might very well be the case. But consider what will happen if -- or, rather, when -- someone does eventually get injured or killed during one of these massages. A human will have died and a snake (or five) will be blamed, vilified and likely have to die as well. Right now, the Burmese python massages aren't even harmless fun -- they're just potentially harmful, and not a good idea.